A 79-year-old man presented after a week of pleuritic-type chest pain, dyspnea and a swollen, painful left arm. His past medical history included benign prostatic hypertrophy, vitiligo, hearing loss and a combat wound to the chest experienced 58 years earlier, with a bullet left in situ adjacent to the aortic arch near the superior vena cava. His sole medication was sildenafil. 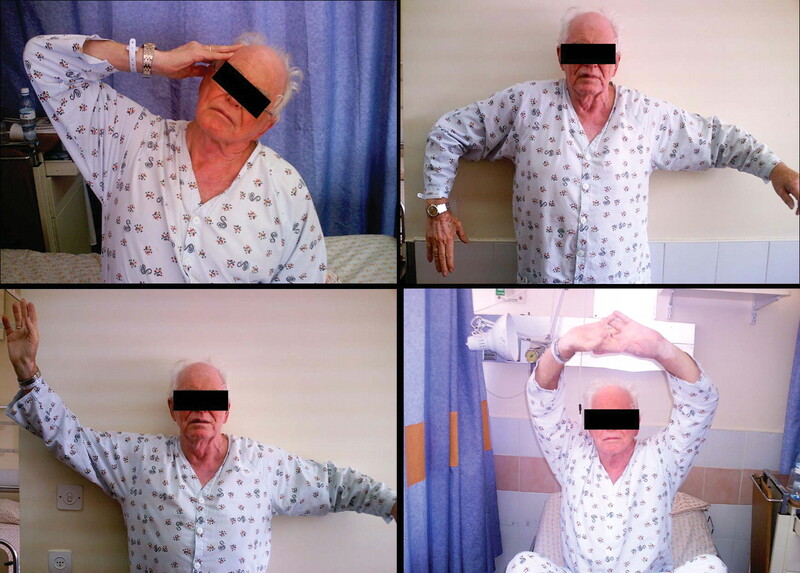 He reported that for the past 2 months he had engaged in vigorous exercises for up to 30 minutes a day that involved the shoulder girdle (demonstrated with his right, healthy arm in Fig. 1) and that he had had no recent injuries to the left arm. The patient was right handed. Physical examination revealed a general nonpitting edema of his left arm and forearm and marked superficial venous engorgement. Some reddening of the arm was noted, with moderate pain during movement in all directions. Doppler ultrasonography revealed a thrombus in the left subclavian, jugular, axillary and brachial veins. A CT of the chest did not reveal pulmonary embolism or a source of external pressure at the thoracic outlet. The patient had no personal or family history suggestive of thrombophilia. However, he was found to be heterozygous for both factor V Leiden and methyltetrahydrofolate reductase C677T mutations. Results of tests for other causes of thrombophilia (including protein S, C, antithrombin III and prothrombin G20210A mutations) were negative. The result of an initial anticardiolipin IgG antibody test was low positive, but that of a repeated test was negative. Apart from vitiligo, no signs of autoimmune disorders were present. Enoxaprin and warfarin therapy were started, with rapid and complete resolution of symptoms. Follow-up during the next 6 months was unremarkable. Deep-vein thrombosis of the upper extremity occurs infrequently, constituting only 10% of all deep-vein thromboses.1 The majority of cases are secondary or iatrogenic, often associated with central venous catheters or pacemaker electrodes. The primary form of upper-extremity deep-vein thrombosis is rare, with an annual incidence of 2 per 100 000.2 The primary form can be idiopathic or may be effort induced (also known as Paget–Schroetter syndrome). The mean age at onset of the primary form has been reported to be 59.2 (standard deviation 18.2) years, with men and women affected in equal proportions.1 Patients whose condition is effort induced tend to be young adults (usually in their 30s) and otherwise healthy. In many cases the thrombosis develops after strenuous exercise of the arm and typically involves the dominant arm. Treatment options for deep-vein thrombosis of the upper extremity are anticoagulation, thrombolysis (catheter-directed or systemic) and surgery (suction thrombectomy, angioplasty, vein stenting, surgical thrombectomy and thoracic outlet decompression). There is no consensus as to what is the best treatment option. As a rule, younger patients are presumed to do better if venous patency is restored (mainly surgically), whereas older patients can be managed with anticoagulation and physiotherapy. Our case also illustrates the challenge of caring for elderly patients. Although the burden of chronic and degenerative illnesses remains high, some elderly patients may present with diseases that were once observed only in young adults. Conservative treatment paradigms will need to be reconsidered in this setting, in order to achieve similar outcomes in the college athlete and the active octogenarian. Joffe HV, Kucher N, Tapson VF, et al. Upper-extremity deep vein thrombosis: a prospective registry of 592 patients. Circulation 2004;110:1605-11. Joffe HV, Goldhaber SZ. Upper-extremity deep vein thrombosis. Circulation 2002;106:1874-80. Cassada DC, Lipscomb AL, Stevens SL, et al. The importance of thrombophilia in the treatment of Paget–Schroetter syndrome. Ann Vasc Surg 2006;20: 596-601. Juul K, Tybjaerg-Hansen A, Schnohr P, et al. Factor V Leiden and the risk for venous thromboembolism in the adult Danish population. Ann Intern Med 2004;140:330-7. Buller HR, Agnelli G, Hull RD, et al. Antithrombotic therapy for venous thromboembolic disease: the Seventh ACCP Conference on Antithrombotic and Thrombolytic Therapy. Chest 2004;126:401S-28S.